I really think I have finally picked my favorite finish of nail polish. While I do love my creme polishes, I have come to the conclusion that pigmented jelly polishes with glitter are my favorite. I own every single Deborah Lippmann polish that is a jelly base with chunky glitter, and I have my eye on about 30 different indie polishes that are the same concept. I gravitate towards jelly polishes but nothing beats a good opaque jelly with glitter. Case in point, Zoya “Roxie”. I picked this baby up a few months ago and I am kicking myself that I didn’t put it on right away. 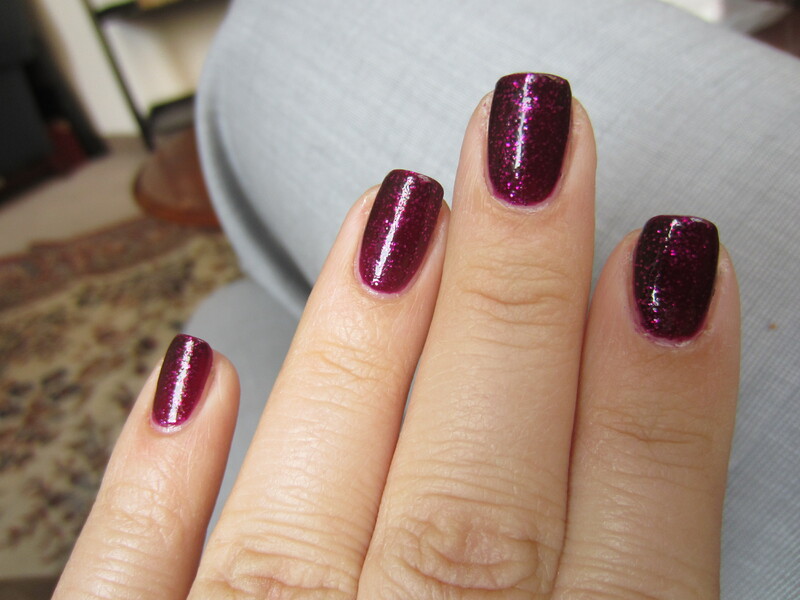 This polish is a dark purple-red jelly packed with right magenta micro-glitter. This is very reminiscent of all those other glitters in a jelly base but what I love about this polish is that it was a dream to work with. Roxie went on this opaque in just 2 coats, and like a lot of other polishes that are a similar consistency, it dried pretty fast. It wasn’t Sally Hansen Insta-Dri fast, but fast enough where when I was done with my last finger the first was completely dry. Another thing that I didn’t photograph because I didn’t even realize it until I was about to take this polish off, but in artificial light indoors, this polish also has a blue flash. Weird as it sounds, and it might be the type of light bulbs I was around, but it almost looked like the glitter inside was so magenta that it had a blue flash to it. I love this polish and the name is so appropriate. It totally reminds me Chicago the musical and I feel like Roxie Hart would wear this. I love this polish and be prepared to see more swatches this fall! Like like like a billion times, what a gorgeous polish!